Rose was upset with me. 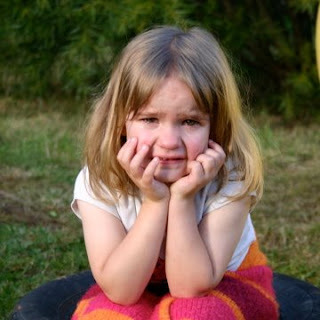 I went outside to take photos of the girls and Clare was first. "But I wanted to be first!" cried Rose and she ran and hid. So I took her photo anyway. I think Rose has forgiven me as I asked her if I could put this photo on the blog. She smiled at me and said "Yes." Quick to cry and quick to laugh. The trials and joys of being 3 years old all in the short time of 5 minutes. 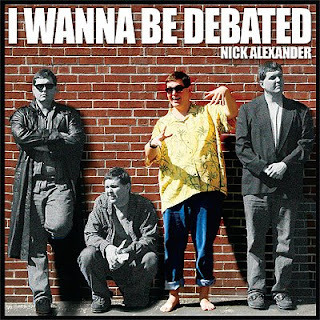 Some time ago I was able to download a couple of Nick Alexander's songs, "Should I Stand or Should I Kneel? ", "I got you saved" and "Evangelize". We have been enjoying these parodies of their popular counterparts ("Should I Stay or Should I Go", "I Got You Babe" and "I Will Survive") and although Nick doesn't have the finest singing voice, the lyrics are great and we have no fear singing along in our less-than-excellent singing voices ourselves. These songs are all Catholic parodies and very humourous. Should I Stand or Should I Kneel covers the confusion newcomers feel trying to work out when to stand, sit or kneel at Mass. Ariel's comment was how rude the singer's friend was to invite him to Mass and then sleep in, leaving the singer to work out what to do himself. Very funny. We purchased the albums from iTunes, but there are other alternatives on Nick's website. Martin has reached another milestone. We have gates on the back balcony to allow Martin to wander outside, yet not out in the yard. 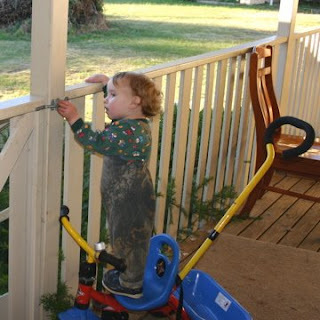 Today Lana was chatting with her Mum when they noticed Martin pushing his little tricycle to the gate, standing on the seat and opening the gate latch. He then swung the gate to and fro in great enjoyment. Now we have to work out another way of securing the gates. This photo is a re-enactment for our faithful readers. Martin was quite happy to show off his new skill again. It is hard to remember sometimes that he is only 13 months old. This is the first in what will probably be a series detailing the ongoing adventures of "The Relocator". We found these really warm woollen boots when we lived in the US and knew they would be just right for a baby about one year old. Martin finally was old enough to wear them and he enjoyed them when he wore them the first time. He wandered around outside and the next time we saw him he only had one boot. 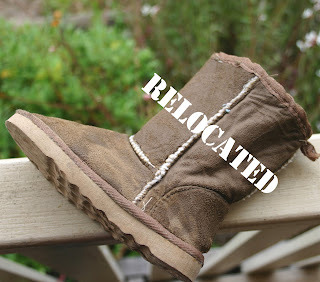 In a futile gesture, we asked Martin, "Where is the other boot?" Naturally he only grinned and turned on his Cuteness Generator TM. A search of the back yard revealed nothing. Lana's Dad was cleaning an area of the yard this morning and noticed a shape in the water tank overflow. Sure enough, there was the boot. He showed it to us and asked, "Are you looking for this?" 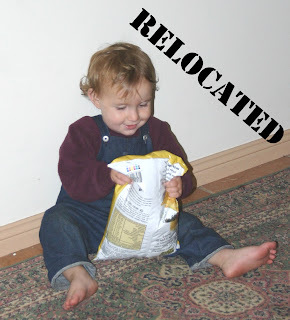 We looked at each other and said, "The Relocator!" It's now drying out on the back deck. Clare has a pack of Princess Uno cards. These were very cheap and we soon realised why. They were made in China by Mattell. Note the mis-spelling. They couldn't even create a ripoff with the correct spelling of the company they were ripping off. Clare and Rose play the game on the floor and every now and then Martin will run through the middle of the game, occasionally collecting a card or two on or about his person. When Ariel visited the toilet, she looked into the bowl upon entry and saw these three cards sitting at the bottom of the bowl. "Eeeewwww!" she said and rescued the cards. They were very clean! She showed the cards to Clare and asked, "Missing these?" 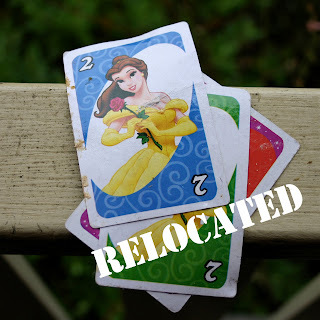 We looked at each other and said, "The Relocator!" Last weekend I returned from a couple of days away with work. I bought some corn chips for the family and had them in my overnight bag. Before I had completed a hug and catch up of the news from the family, Martin had opened the overnight bag, picked up a chip pack and wandered quietly out of my office/study. Eric caught him examining the chip pack in the hallway. Martin knows food is in that packet and he wanted to get at the chips somehow. He is obviously very pleased with himself. Sadly for him he couldn't work out how to open it so we were safe. A short time afterward we called him over. He got up and fell over backwards and sat on the chip pack. POP! The pack opened and crushed chips flew out. He looked around in temporary shock, smiled a bigger smile as he saw the result of chips all around him in easy reach and quickly helped "clean up " the chips on the floor. The court decision has been made: DMC is in Receivership. "With the support of the official receivers (administrateurs judiciaires), these decisions give all the DMC companies the time required to find solutions allowing the interests of the staff and shareholders to be upheld and for a future to be mapped-out for these companies. A new era in the history of the DMC companies has started today. By introducing appropriate solutions, it should enable all the companies to be provided with the means of facing-up to the constraints being placed on them: the fall of the dollar versus the euro, Asian imports and consumers’ concerns about their spending power. " Now that is great spin about a decision to be placed under the administration of external accountants ("the administrators") to sort out the mess. It is sad to see that avoiding the problems and not reacting to internal accounts leads to these type of results. Either their accounting system didn't give them timely accurate reports, or they didn't pay attention to them. Either way, being placed under administration is not a good "new era" unless the old self controlled one was a bad one. Now what? The administrators of DMC have up to six months to work out the accounting mess and see if there is anything worth saving. Can they change the cost structures enough to still make money considering the effect a devaluating dollar is having against fixed Euro costs? A brief explanation: When the costs are in Euro and sales are in US dollars, if each US dollar buys less Euros, it means more US dollars are needed to cover the same costs. This can only be achieved by 1) selling more, 2) charging more or 3) spending less. It is up to Administrators to find out to what extent they can do all three. But because DMC management wasn't able to do it themselves, it must be done in a short time, with the public and business partners nervous and the economy looking flaky. Martin has now progressed to a "Relocator - advanced student". He has worked out you can get to all the things put out of reach by pushing a chair or box or anything that will move closer to the desired object and climbing higher. The dining chairs are pretty heavy but he just pushes harder. 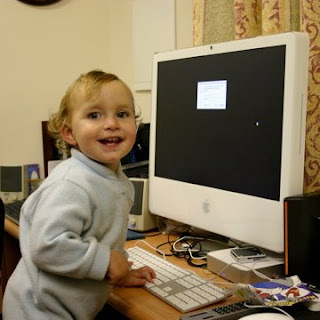 As you can see here, he can now reach the computer. This is why everyone has a password and the screensaver is password protected too. In this small way we have some protection from marauding fingers. Although the screen does have interesting finger and hand shaped prints obscuring the view. Are you sure the Jedi are the good guys? I am not convinced that the Jedi are actually the good guys. After all, they aren't fighting for good - they are willing to kill, control minds, take apprentices whilst leaving the mothers in slavery, and only fight for balance. That's right - they don't mind evil, so long as it is evenly matched with good. So the prophecy that Anakin would bring balance was a pretty good one. No good and no bad means all is in balance. A perfect Jedi result. The rebellion is just another power group trying to take power. Every world they take over becomes a den of violence and anarchy. The Ewoks were cohabiting peacefully with an Empire outpost. Then along come these rebellion people, pretending to be gods and saviours, getting them killed for some power play that ultimately gave the Ewoks no real benefit. Before the battle of Endor they lived in peace. After lots of deaths they supposedly lived in peace again. So what was the fighting for again? This doesn't mean Darth Vader or the Emperor are good guys either. It's a bit like the Eastern front of World War II. You couldn't really support either the Russians or the Germans as both were totalitarian evil empires ruthlessly killing their own and other people using bullets, tanks, secret police, concentration camps and gulags. One last thing. We consider Duct Tape to be like the Force. It has a light side and a dark side and it binds the universe together. In recent days, there has been a significant amount of information in the form of press releases, media reports, etc. regarding financial difficulties and operational restructuring plans at the DMC corporate offices in France. Those activities and court filings within the legal system in France are directed towards seeking a formal resolution for two divisions within the DMC Corporation (Sportswear fabric and a small chain of retail stores found only in France) that are not related to the embroidery thread and craft activities, which remain the core business of the corporation. In addition, the U.S. division of DMC operates as a separate legal and financial entity with its own financing, receivables, payables, etc, and as such, is not included in any legal filing or petitions to the courts that may occur in France. We are financially secure and fully prepared to conduct business as usual here in the U.S.
DMC has been manufacturing needlework threads for 262 years and we remain committed to providing stitchers with the highest quality embroidery floss, specialty threads, needlework fabrics and other supplies they need to continue to enjoy the wonderful art of needlework. We look forward to continuing to serve all of our customers and loyal users of DMC products into the future. You will note that the statement says that DMC USA is just an administration and distribution operation. Production is still in France, of which two major parts of the business are filing for Bankruptcy, with workers who aren't being paid. We will see how the thread factory part of the business is affected. If DMC USA has no future product, how does it keep operating long term? As we said, interesting times ahead.